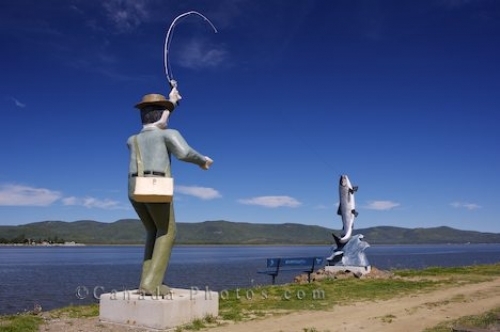 Statues of a fisherman and an Atlantic Salmon along the river bank in Campbellton, New Brunswick overlook the Restigouche River. When visitors stroll along the river bank in the town of Campellton, New Brunswick, they can admire the statues of a fisherman and a large Atlantic Salmon. A fisherman has cast his line and caught a large Atlantic Salmon which is what many fisherman pull out of this river, especially during the yearly salmon festival. Picture of the unique statues on the river bank of Campbellton, New Brunswick in Canada.